The house of Chandrakant Kurankar at Mirapur Galli Shahpur was gutted in fire which was caused due to a short circuit as per sources. The incident happened at around 10.45 AM and smoke started to come out of his small black roofed tiled house. All the material in his house including clothes and important documents were gutted in the fire. 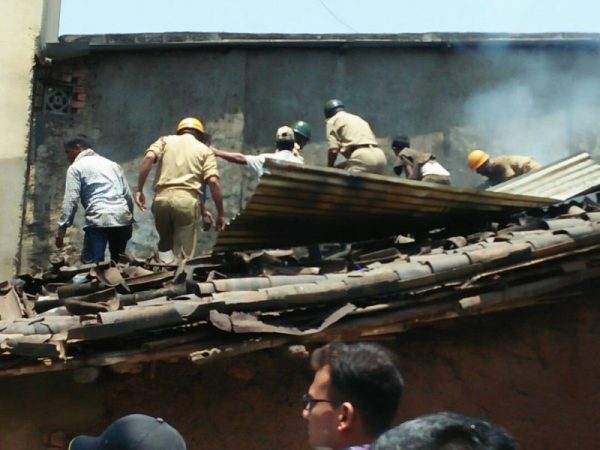 The Family had no where to go for shelter when the Panch committee, the Ganesh yuvak mandal and others pooled in and helped the Kurankar family to get over this tragedy. MLA Sambhaji Patil along with Mayor Sanjoyt Bandekar also paid a visit and assured of help. It was a depressing view from my house as I stay in front of kurankar’s house. All my galli mates within a second were struggling to put down the fire. Because of dense smoke, it was becoming difficult to find the core of fire. We were struggling till 30 min to put down the fire till then fire brigade vehicle arrived and firemen rushed to extinguish the fire. The combined efforts of firemen n local men succed to put down the fire in 1 n half hours. But till then the damage was server, clothes, utensils, electronic equipment, wooden cubboards, walls, ceiling were burned. The house members were crying like they have lost a family member. It was very sad to see them is such condition. My galli mates consoled them and gave them confidence and assure them to be by they side in this critical time n with the help of generous ppl of my galli, they were provided with food n shelter for few days. I feel very proud that I stay in mirapur galli, were humanity is still alive and people do care for each other. I request, city cooperation, mayor, generous ppl, insurances company, agencies, foundations to provide finiacial help to this poor farmer family, as there is only one single women who is earning for this family. As the family members are now settle and suitation is under control. I sense, what is the reason of catching fire and why it took so much time to extinguish the fire by firemen and why the firemen were not using gas mass when there was dense smoke in house to find the place or room from where the fire was initiated. Why fire brigade vehicle were not using forms, as water was not helping much to extinguish the fire. Why fire brigade vehicle is not equip with advance instructions n where were those fire brigade bikes when their huge vehicle were not able to entre narrow galli. These questions make me to think, are we safe.